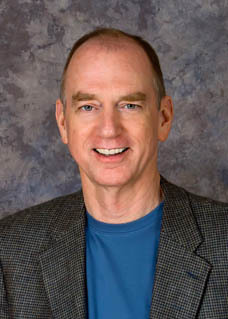 My last post, Clarifying Sequence of Returns Risk (Part 1), was a bit heavy on the math for some people (that is to say, it contained some math), so I thought I would summarize it with some pictures and a few additional comments before moving on to a broader view of large losses early in retirement and a different kind — to my way of thinking — of sequence of returns (SOR) risk. An important point from Part 1 is that the impact of the sequence of market returns on our investment results depends on the investment policies we choose. From its peak in October 2007 through September 2013, the S&P 500 returned an average of 2.19% a year. Those six annual returns might have arrived in any of 6! (6 factoral) different orders, which is to say by one of 720 different paths. But if you invested $1,000,000 in the S&P 500 at the 2007 peak and still held those stocks at the end of six years, you ended up with $1,138,544 no matter which of those paths the market might have taken. 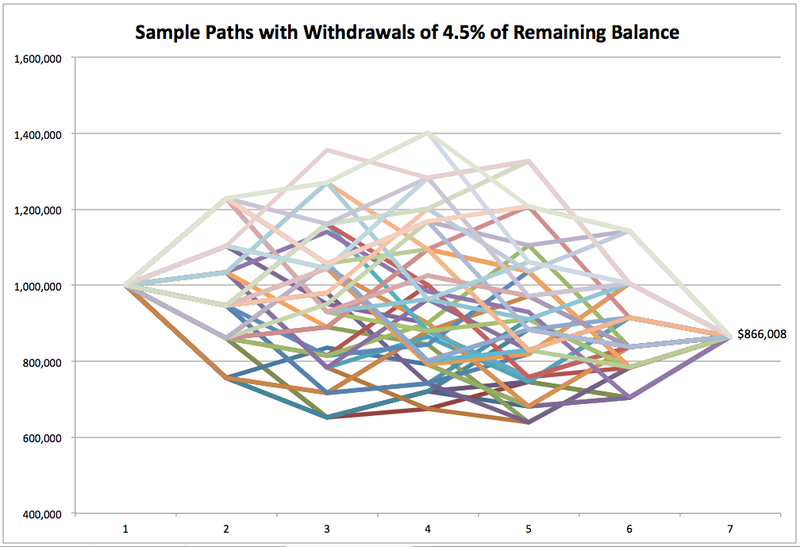 Safe withdrawal rate (SWR) strategies, which sell a constant dollar amount of stocks periodically, do have SOR risk. Here’s a graph of an SWR strategy over the time period mentioned above in which the investor started with a million dollar portfolio and withdrew $45,000 a year. 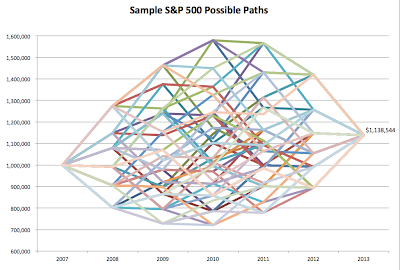 Again, there are actually 720 annual return paths the market could possibly have taken, given all permutations of 6 annual returns. 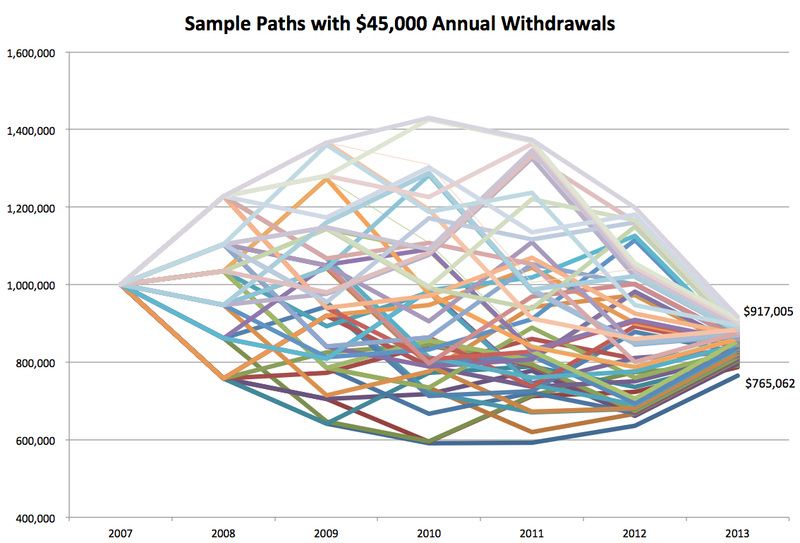 Those paths end up in different places when you withdraw fixed dollar amounts periodically. The actual path the returns followed during this time period went from a million dollars to $776,461 in this scenario. The worst path (returns ordered smallest to largest) would have taken the portfolio to $765,052 by October 2013, and the best (the opposite order) to $917,005. And that’s risk as finance defines it: uncertainty of outcomes. 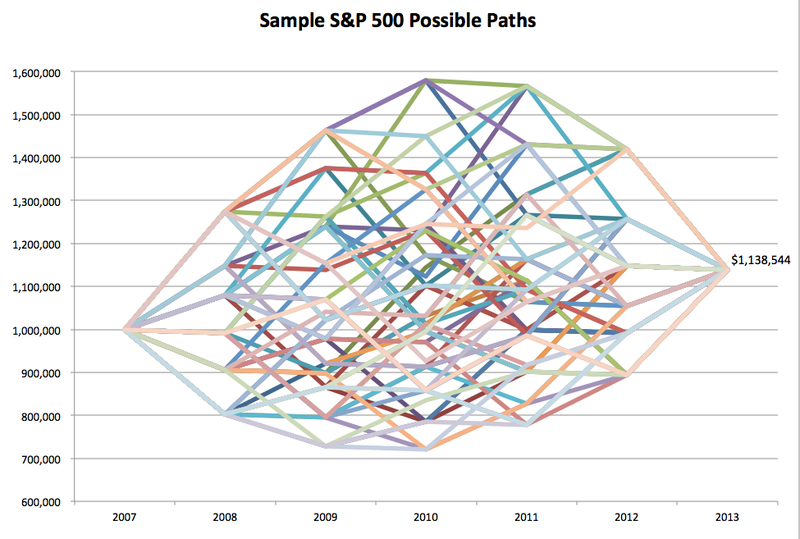 For this time period, only 8 of the 720 possible paths led to worse returns than the actual outcome. Today, I’m looking at the risk associated with terminal portfolio values and not the annual payouts, which also differ by spending strategy. I’m less concerned with fluctuations in annual payouts than I am with depleting the source of those payouts. I showed algebraically in my last post that an investor can avoid this SOR risk by selling a constant percentage of remaining portfolio value periodically, for example, selling 4.5% of remaining portfolio value each year instead of a constant $45,000. The same is true of buying in the accumulation phase. Here’s what those paths look like. There are 720 possible paths with this strategy, too, but notice a big difference between this and the previous chart: all paths end up in the same place — $866,008 in our example. When you withdraw a constant percentage of remaining portfolio balance annually, you have no SOR risk. The ultimate portfolio value doesn’t depend on the order of market returns. We can eliminate SOR risk to our portfolio’s terminal value by basing withdrawals on remaining portfolio balance, but this does not eliminate SOR risk from our portfolio payout. In fact, we cannot eliminate SOR risk from the payouts of any strategy that spends down a portfolio of stocks and bonds. We simply cannot expect to safely withdraw a constant amount from a volatile portfolio. This brings me to what I believe to be a critical point: when you buy and hold, or buy or sell a constant percentage of your remaining portfolio balance periodically, you are gambling that stock prices will be higher in the future. That’s market risk. But when you withdraw (or invest) constant dollar amounts periodically, or random dollar amounts, or changing percentages of remaining portfolio balance, you are placing a large side bet on which path those market returns will take to get there. You’re adding a significant amount of risk to your investment, as can be seen by the single outcome for percentage withdrawals and a wide range of outcomes for constant dollar withdrawals. The constant dollar withdrawal policy had a range of outcomes of nearly $152,000 for a portfolio that started out with a million dollars. We get compensated (over the long term) for taking market risk. Sequence of returns risk, however, is not market risk, but risk that an investor may add with her investment policy. The market cannot reward you for that risk. Investors with SOR risk add additional risk that is not diversifiable and with no expectation of additional reward. What strategies escape sequence of returns risk? Many of the columns I have read recently suggest that the only way to avoid SOR risk is to avoid volatile assets like stocks, or at least to reduce your exposure to stocks to reduce SOR risk. Though that will certainly do it, that doesn’t appear to be the only way. Buy and Hold is a special case of percentage withdrawal strategies where the percentage sold simply equals zero. There is no SOR risk. Though I have not done the math, I would expect Value Averaging to avoid SOR risk. 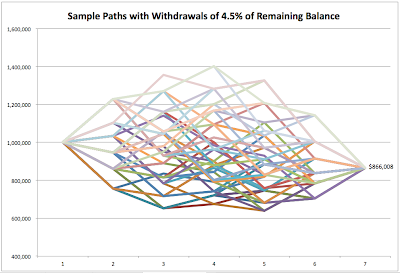 As I have shown above, withdrawing a constant percentage of remaining portfolio balance has no SOR risk. Dollar Cost Averaging and Safe Withdrawal Rate strategies are both exposed to SOR risk — they buy or sell constant dollar amounts — and perhaps that is why they underperform in most studies that compare strategies. Lastly, the number of possible market return paths increases by a factorial every period. Given its source, you would expect SOR risk to be cumulative and to grow rapidly with the number of interim transactions, and it does. 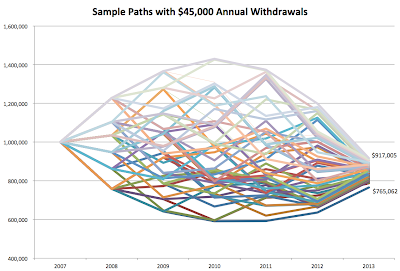 I ran a 30-year set of S&P 500 annual returns from 1983 to 2012 and found that the best and worst possible outcomes for a $1M investment and $45,000 annual withdrawals ranged from about $39,000 to $42,000 after ten years. After thirty years, the range grew to $50,000 to $200,000. So, here are my take-away’s from this post. Sequence of return risk comes from our investment policies, not from the market. It is the result of the uncertainty of prices at the interim buy/sell transactions after the initial investment. There is no SOR risk with Buy and Hold because there are no interim transactions. There is also no SOR risk when we buy or sell amounts based on remaining portfolio balance, as I showed algebraically in my last post. SOR risk increases dramatically over longer time periods because there are far more interim transactions that introduce more price risk. SOR risk cannot be diversified away, nor are we compensated for it. Choosing an accumulation or spending strategy that introduces additional risk that is un-diversifiable and uncompensated cannot be an optimal approach in either phase. There's more to Sequence of Return risk and it's going to take a few more posts to cover it. I hope you'll stick with me for the next post on this topic, Sequence of Returns Risk and Payouts. This (and the whole series) are some of the best articles I read on SOR!! One thing that did not make sense to me is using "fixed percentage" to remove SOR during accumulation phase. Mathematically it does remove the SOR (you get the same TPV in the end) but that TPV will likely be worse than DCA (or other systematic buying strategies like "buy when you have extra money" :)). If you contribute fixed percent of PV you will end up buying more when PV rises (stocks are more expensive) and less when PV falls (stocks are less expensive) which is the opposite of what should be done. Glad you enjoyed the series. I don't believe I recommended "fixed percentage" or any other method for the accumulation phase. While you're working, I'm a fan of William Bernstein's recommendation to "save as much as you can for as long as you can and never stop." What you want to avoid at the end of accumulation is a market crash just before retirement when you won't have time to recover. To deal with that, I recommend lowering your equity allocation for the last decade before retiring, not altering your savings pattern. Dollar-Cost Averaging doesn't work, by the way. Here's an explanation recommended to me by economist, Zvi Bodie. You should contribute as much as you can in the accumulation phase, not a fixed or variable percentage of your current portfolio value. To be clear, I don't recommend fixed percentage or variable percentage spending during the deculumation phase, either.